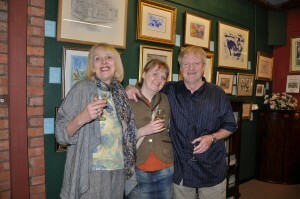 A preview evening for invited guests was held 0n the Friday evening before the exhibition official started on the 28th April 2012. The room was full of collectors and admirers all evening. 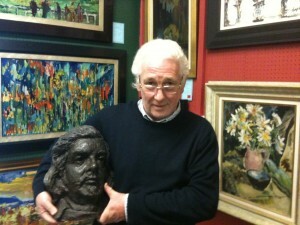 Three of the Isherwood family were in attendance, Clive, the late artist’s nephew said he was very pleased that so many have become collectors of his uncle’s work and couldn’t have wished for a better exhibition. Molly Isherwood, the late artist’s sister in law was unable to be at the preview due to being on holiday until the following day. By the end of the exhibition, about three quaters of the paintings had been sold. The prices ranged from £400 to over £3000. Colin said that this is a clear indication that the work of Isherwood is in demand and that prices are still rising. Many collectors travelled from all over the UK to buy paintings, as well as first time buyers that were captivated by the beauty of some of the works. There was even one painting sold over the phone without being seen, the collector had been on the lookout for a painting by Isherwood of a particular subject, he was over the moon when he got it. 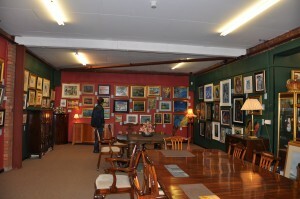 Many of the paintings on sale can now be seen in the various galleries on this site.